How many continents do you think we have in this world? I think there are 7 continents like most people but some people say there are only 6 and that there is only 1 America, others say there are 3 Americas: North, Central and South America so that means 8 continents. Some even call europa and Asia a single continent Eurasia. Others think Australia, New Zealand, New Guinea and Pacific islands all belong to Asia. There is Indian subcontinent too. Is that a part of Asia? Some people think there are only the Old world (Europe, Asia and Africa) and the New world (both Americas, Oceania and Antarctica). That is all very confusing for me. Even the scientists can't agree. This pergunta is not so absurd as you think. Please answer this pergunta if you can. I've always separated continents mais or less por human cultures. You have North America, Latin America, Europe, Middle east, sub Saharan Africa, India, East Asia, and then Antarctica. That makes 8.
there is only one continent and that is Pangaea. 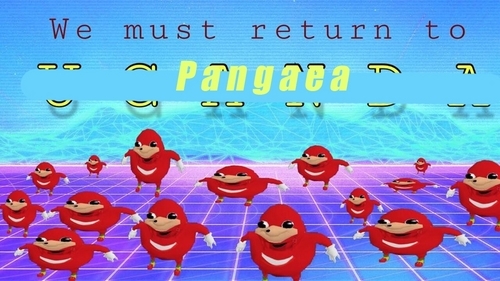 We must return to Pangaea. Those were some pretty good times. I'm totally down for it !!! !